This month, Byfield Consultancy is celebrating our 10 year anniversary as a specialist legal communications consultancy. Legal PR has come a long way in the 10 years since we launched and law firm PR teams have grown significantly. 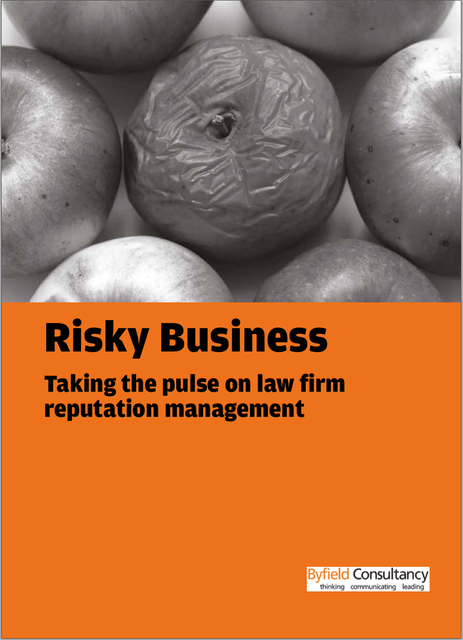 We wanted to gauge the views of those in-house PR teams – the custodians of their law firms’ reputations – on the key reputational risks facing their firms and the profession more widely. In order to do so, we partnered with Legal Business magazine and surveyed 50 PR professionals from the LB top 100 law firms. We are proud to launch our report, Risky Business, and would like to thank everyone who contributed. It has been a thought provoking project which yielded some intriguing results. Of the 50 in-house PR respondents to our survey, nine in ten believe that reputational damage hurts recruitment, 88 per cent believe it can damage profitability and three fifths would approach an external consultancy to help them manage a serious risk. Law firms’ investment into growing and protecting their brands in recent years is evidenced by the number and calibre of the in-house PR teams you now find within law firms. Walk into any top 50 firm today and every one of them will contain a head of PR with significant experience of working with law firms or related professional services. The picture was very different 10 years ago. Increased competition and risk, a rush to internationalisation, and more intense scrutiny from the regulators and the media have all meant that reputation management within law firms is now maturing. Our survey points to some encouraging signs of that maturity: 60 per cent of respondents have a clear strategy in place to deal with reputational issues and 37 per cent of them have regular meetings with their managing partners around risk management. However, other indicators show that many law firms are playing catch-up when compared to their corporate cousins, where senior PRs often have a seat at the boardroom table. A worrying minority of respondents said they never met with their managing partner to discuss what was keeping him or her up at night and over a fifth had never reviewed their reputation management plans. The research highlights that earlier consultation on law firm decisions; regular management protocols that anticipate and plan for upcoming threats and a PR being placed firmly on the management board agenda are the three keys to the door of effective risk and reputation management. Smart firms with an eye on the future will increasingly involve PR professionals in key business decisions and treat PR as a hard-nosed business discipline that impacts the bottom line, rather than a ‘nice to have’ part of their promotion.